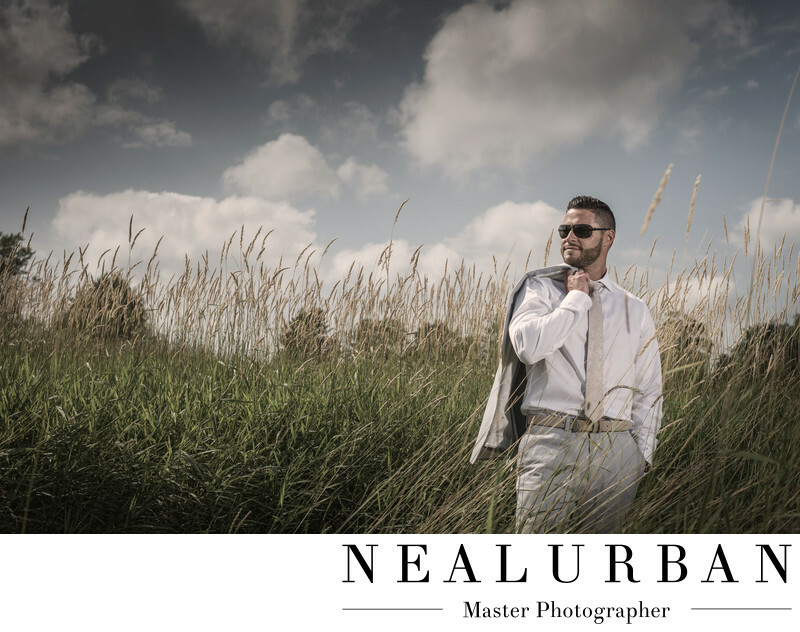 Neal Urban loves tall grass for portraits. It always adds such nice texture to an image and if shot correctly, the images look amazing! We went to Knox Farm State Park for the idle for Jenne and Michael's wedding in July of 2017. The wedding reception was at Columns Banquets in Elma, and Knox Farm is right around the corner. They wanted rustic outdoor style photos. This was the perfect location for that. After we work with the wedding party for photos, we send them back to the limo so we can get some really nice and intimate photos of the bride and groom. Sometimes having more people present, distract the couple and can make them uncomfortable. Michael did not seem to matter here! This tall grass was located pretty close to where the limo had to park, but Neal knew he wanted to use it for portraits with the groom. We had him take of his suit jacket for a more casual look. He had some great sunglasses. So we had him throw his jacket over his shoulder and look off. Definitely model quality here! He had such a great smirk. Neal took this image from a lower angle to get more of the sky in the shot. The clouds looked really good. If it was shot directly straight on, I think there would have been too much green. Because it was mid day harsh sun, we did use lighting for this image. We had to fight the shadows caused by the sun and even everything out. This groom portrait belongs on a magazine cover!